We first managed Google Ads (PPC ads) in 2006. They were a lower budget item compared to optimizing websites and content for search engines (SEO). Back then, Google operated as a pure search engine. Search results were solely earned on the merit and structure of content. Marketers were pinching themselves. Ad spending could be drastically reduced. That budget could be invested in more content creation, resulting in a better web presence. Which meant more potential buyers could see the site. Google—back then—was a free lead generation tool if the content and website were optimized correctly. This leveled the playing field. Small businesses competed head-to-head against global giants. It was fantastic. Example of Google Ads as they appeared in 2006 using the search phrase Term Papers. Mid-year, Google introduced “carousel” results, much to the consternation of marketers. It ate up a lot of top-of-page real estate. The carousel pushed organic results down, often “below the fold” (the imaginary first section that is displayed without scrolling). Local restaurants with an optimized website before this could naturally rank just under those three or four ads. The carousel was not democratic. It forced companies like restaurants and bars to sign up for other Google services, like Places (a Google business list) and Google+. There were key elements that had to be included. It was painful. It hurt small businesses more than big corporations who had a full-time marketing team on staff. Organic results were imperiled. 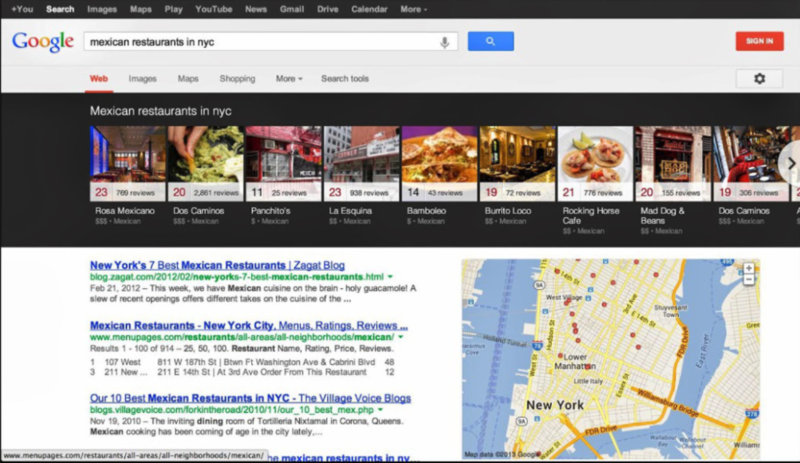 The good news is Google started with restaurant results. After much uproar, the carousel quietly disappeared. It was obvious Google was trying to figure out how to monetize the area they had been training people to “trust” for organic results. Google Ads 2013: This Unpopular Variation on Search Display Was Short-Lived. As Google became more powerful, ad revenue became a top priority. And so began their acquisitions and, most importantly, dramatic changes in how ads were displayed. After 10 years’ momentum, Google was launching massive updates. By the end of 2016, Google ditched the distinct colored margin and mixed ads directly into the main search results window. Small businesses could no longer compete on a well-optimized website alone. Easy to spot (and ignore) ads were replaced with stealthier paid results. The yellow box was gone, so the ads on the same white background as organic results made it harder to distinguish the “real” results from the “paid.” The only thing to distinguish ads from natural results is a small tag ‘Ad.’ In most cases, sidebar ads were gone. This small yet effective move is what turned the tide. It changed our view of Google ads. 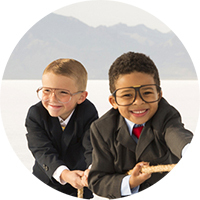 Our delicious and free lead generation tool had finally become pay-to-play. 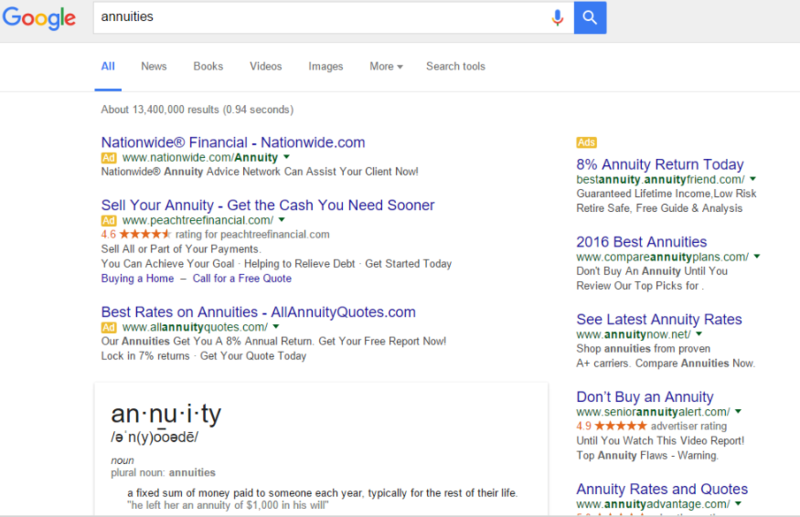 The Distinctive Yellow Box Disappears As Google Ads Mingle With Organic Results. Ads have become mandatory in order to maintain a competitive search presence. And for mobile searchers? Forget it. Ads are a must if companies want any presence at all. Mobile search volume overtook desktop search volume in 2015. Google continues to make dramatic changes. Underlying principals and best practices for content remain unchanged. If a company can afford to outspend its competitors, it still must provide what Google deems a “quality experience.” This means a thousand dollar Google ad campaign won’t be promoted by Google if the landing pages are misaligned with the ad. Or if the website content is off-topic. And especially if the pages are designed poorly and the user experience is horrible. If the landing pages that ads link to are relevant to each other, and if the website doesn’t have low-quality marks, then yes, they will dominate for obvious search terms and phrases. Big brands who do follow content best practices have the added power of their deep pockets to run ads that box out smaller businesses. So How Do Small Businesses Compete? Strategy, user experience, and content are everything. Find someone who understands how the PPC landscape has shifted. It gives context to the ads strategy and helps avoid the pitfalls of expensive experimentation. While more expensive than Manual CPC (Cost-Per-Click) bids, Google’s new Enhanced CPC is quite revealing. By letting the Google robots (AI) decide which ads to show and when to show them and at what bid price, small businesses can mimic what they learn and revert back to Manual CPC by applying the same patterns to the ads the Google bots favored. Professional Google Ads management is recommended to maintain strong results because the landscape of ads and competitors shifts, sometimes radically. There is no “set it and forget it” for businesses that want to remain competitive. The ad opportunities are better than ever. Ads in the old days, frankly, sucked. Crude limitations on an early tool, fraudulent clicks, and spam farms was not an asset. Now, there are tight controls available to make sure every ad is optimized to the penny. And let’s face it: the salad days of free lead generation on Google are gone. In 15 years, Google changed radically. It’s not just a search engine anymore. It’s a primer for eCommerce, so take advantage of it! Competitors will. Paid or PPC or Pay-Per-Click ads have become an imperative element. If staying visible to searchers is a priority, ads are a must. Even in 2006, we knew this was inevitable. Google has provided a strong path for brand awareness and sales conversions. Now, we’re completely on board with paid ads, because the technology has improved so drastically, that it’s worth it. Remember: it’s all about location. Ads now take up the beautiful white space at the top of most search results pages, so let’s make the best of it and compete on ad strategy smarts as well as SEO. Take a look at our special PPC offer to get your brand front and center in search results. If you’ve been considering PPC for your brand, we can help. We provide total creative and management services bundled together in a monthly subscription using Bing Ads, Google Ads, or both. If you’d like to see how we use PPC campaigns, check out our Lead Generation and Customer Loyalty success stories. Jeanie Walker, co-owner of River Dog Digital is Google Ads Certified. River Dog Digital provides clients with strategic ad campaigns, A/B tested landing pages, and SEO website improvements.